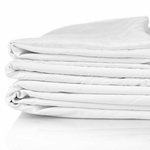 Give your hospitality and lodging guest the best sleeping experience and keep your bed linen cost in check with our wholesale flat sheets, fitted sheets, and pillowcases. From value-priced hotel sheets and pillowcases to luxury hospitality linens and everything in between, your commercial bed linen supply needs are covered with our complete range of hospitality sheet collections. 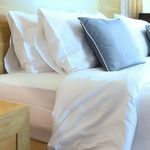 Wholesale Hotel Sheet & Pillowcase Collections: Flat Sheets, Fitted Sheets, and Pillowcases are available separately (open-stock) in bulk by the case pack in Twin, Full, Queen, King, and Extra Long sizes. Bulk Case Packs: Flat Sheets and Fitted Bed Sheets are bulk packed either 1 or 2 dozen per case & Pillowcases are bulk packed 4, 6, or 12 dozen per case depending on the collection. Cotton-Polyester Blended Sheet Collections: the hospitality industry standard, are available in qualities ranging from Economy 180 thread count for economy properties up to Premium Quality 300 thread count sheets for pampering your guest in comfort. Brushed 100% Microfiber Polyester Sheet Collections: excellent value for hospitality use when durability, guest comfort, and cost are equally important. Available in light-weight 90 gsm microfiber and medium-weight 110 gsm microfiber collections. We are here to make sure you get the best value for your property and your guest at the lowest cost for your business. If you have any questions or if you would like friendly guidance, contact us. We love helping our clients! With a little information about your specific bed linen use and care, we can offer recommendations based on our years of textile experience. Looking for Spa and Massage Table Sheets? Jump to Wholesale Massage Table Sheets.